Taipei, Taiwan (6 June 2018) – G.SKILL International Enterprise Co., Ltd., the world’s leading manufacturer of extreme performance memory and gaming peripherals, is showcasing a series of ultra-high speed DDR4 kits on various platforms at Computex 2018. 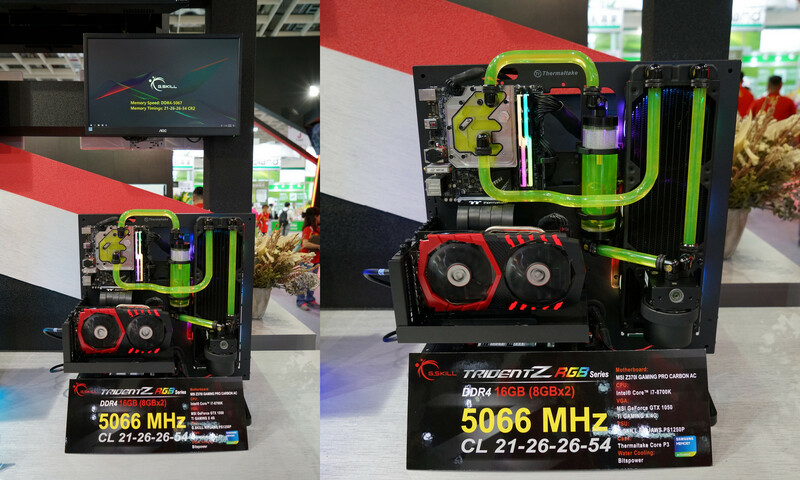 Chasing after the fastest possible memory speed, G.SKILL once again breaks the limits and presents the Trident Z RGB DDR4-5066MHz extreme dual-channel kit built with Samsung 8Gb ICs, which is the highest frequency dual-channel memory on live demo display at Computex 2018. This extremely high memory speed live demo system is built with the latest Intel® Core™ i7-8700K processor and MSI Z370I Gaming PRO CARBON AC motherboard. Another ground breaking demo memory kit at the G.SKILL booth is the DDR4-4800MHz CL17-17-17-37 2x8GB Trident Z RGB memory kit that’s based on Samsung B-die, which showcases the lowest possible CAS latency timing at such high frequency. This extreme memory kit is demoed with the Intel® Core™ i7-8700K processor and ASUS ROG MAXIMUS X APEX motherboard. In addition to the high-speed 16GB (2x8GB) kits, G.SKILL also is showing the fastest 32GB (4x8GB) memory kit ever seen at DDR4-4600MHz, while maintaining a low CAS latency at CL18-18-18-38. This extreme performance kit is also built with Samsung 8Gb ICs, and is shown alongside the Intel® Core™ i5-8600K processor and ASUS ROG MAXIMUS X HERO motherboard. Ever wonder how fast a compact SO-DIMM DDR4 memory can be? This year at Computex, G.SKILL is displaying the fastest running quad-channel Ripjaws SO-DIMM memory kit at DDR4-4200MHz 4x8GB, constructed with the high performance Samsung 8Gb ICs, featured in a mini-ITX build with the Intel® Core™ i9-7940X processor and ASRock X299-ITX/ac motherboard. Another high speed SO-DIMM memory kit is the DDR4-3600MHz 2x8GB kit displayed on an Intel NUC system, which is modded with custom water cooling. It shows the potential of high memory overclocking performance even on a small form factor system. The AMD Ryzen™ 2000 series processors with the X470 platform offer greater memory overclocking performance than its previous generation. G.SKILL successfully reached DDR4-4000MHz 2x8GB memory speed on the AMD system, built with AMD Ryzen™ 7 2700X processor and ASUS ROG CROSSHAIR VII Hero motherboard.